At night, I asked my father, 'If you could paint your nails any colour right now, what colour would you paint them?' He responded (with surprising alacrity), 'Lilac.' (Why? Because it's spring. Lilac season.) 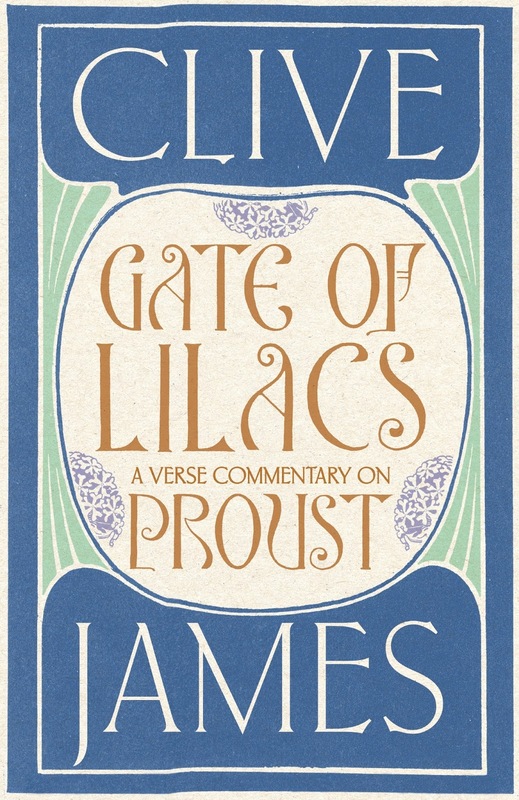 But I thought it perfect for another reason - I had been trying to decide on the perfect colour for an event the following day - Clive James' book launch for his verse-commentary on Proust, called, seemingly in accordance with the time of year: Gate of Lilacs. I arrived at Pembroke in a bright red coat, white dress, feeling rather pale lilac about the gills, and plunged into another writerly adventure. 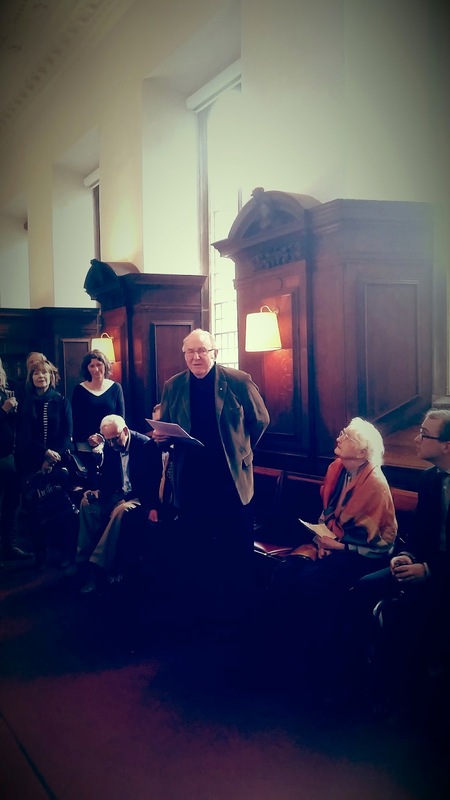 At the entrance to Pembroke's Old Library, the new books were on display - Collected Poems, Gate of Lilacs and Sentenced to Life - I overheard a man order several copies. I looked up. Tom Stoppard. 'Halloooo!' (I did not yodel, but it was thrilling all the same.) He looked nice, almost approachable. And then he disappeared into the clutch of Englishmen and women milling around a seated figure. 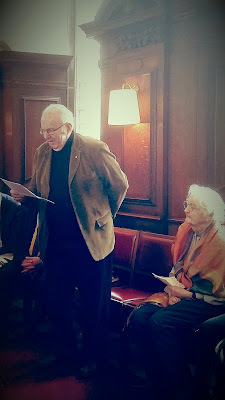 Cambridge, according to one of Clive's oldest fans (102 year old Ann Baer of family Sidgwick) can become quite blasé - being able to boast a roll call of poets, rebels and Nobel prize winners; now the city breathed into the poignant spaces between the lines of the Poet Kid from Kogarah. 'Not a dry eye in the house!' 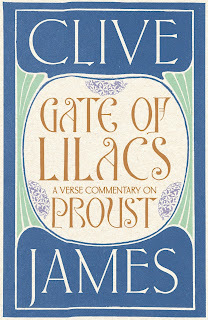 Thus Clive, the Laughing Boy, merry after reading his epitaph. I thought of slinking away after the speeches and wonderful recitation. A small banquet of food was being laid out at one end of the library. I knew I couldn't really face chewing and swallowing in hallowed literary company (Carol Ann Duffy! Mary Beard! Andrew Marr!) but I drifted towards it anyway, just to have a point of focus. And found myself beside Oxford author and media commentator Douglas Murray. 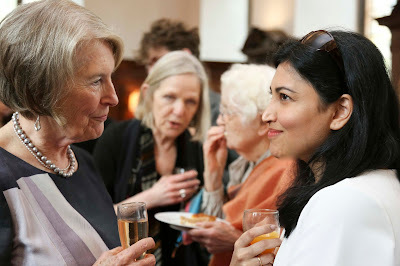 'What is the correct etiquette,' I enquired, 'if you know the name of a famous person, but don't know them at all? For example, is it polite to say 'Hello, Douglas' or is it presumptuous?' Answer: famous people quite like being known, and more, being liked. So now I know. Over munchies, we discussed poetry, memoir and life, but not politics. He was charming, and had beautiful manners because at no point did he indicate by even a flick of the eye that he would rather be hobnobbing with the HobNobs. It was I, in fact, who was still eyeing up Tom Stoppard… 'What do you think?' 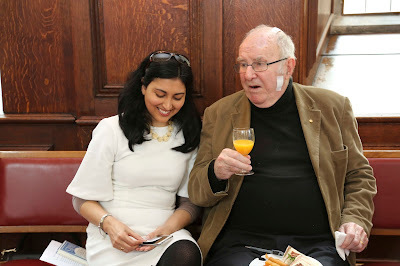 I asked Douglas, whom I now regarded as the arbiter of good taste, 'is it ghastly for a famous person to have a stranger come up and regale them with personal information?' 'Depends,' said the arbiter. I shared my nugget. 'Definitely go speak to Stoppard. He'll enjoy that story.' But, I still couldn't. Instead, I talked to Prudence Shaw, Clive's brilliant wife, a Dante scholar, and confided in her that sometimes I can't summon the energy to 'achieve' - all I want is to play with my nieces. Play the days away. Finally, a spot had cleared by Clive, and I retired to sit in his shade. I ought to say 'in his light', him being the star, but a friend always offers shade. The first thing Clive said when I sat down was, 'Have you met Tom Stoppard? Go and tell him I sent you.' I jumped up, carte blanche in hand, and accosted the poor man over his edibles. 'Clive sent me!' I chirruped. 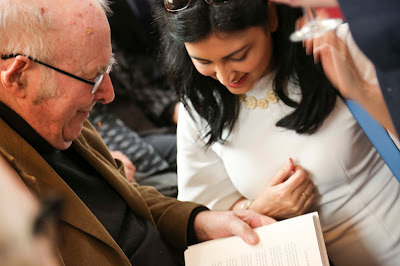 Oh, he was so lovely to me, so kind and interested - and asked me such pertinent questions about my illness that when we finally came to speak of Other Things, I couldn't remember anything I'd done since (and this is the nugget) I played Thomasina in Arcadia at sixth form. And was kissed for the first time, on a stage, by a boy whose girlfriend was in the audience. A girlfriend whose mother had directed the play. Septimus never kissed Thomasina in quite such a dry, papery way as on that stage. Never mind, never mind. One cannot collect all the beautiful shells on the beach, as the saying goes… I retired to phone for a taxi with good grace. 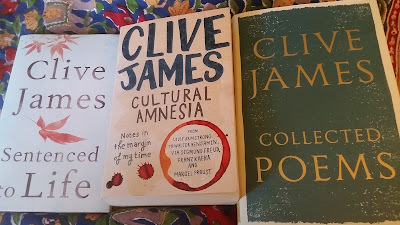 Every time someone asked me how I knew Clive James, I explained that we meet across the drips. 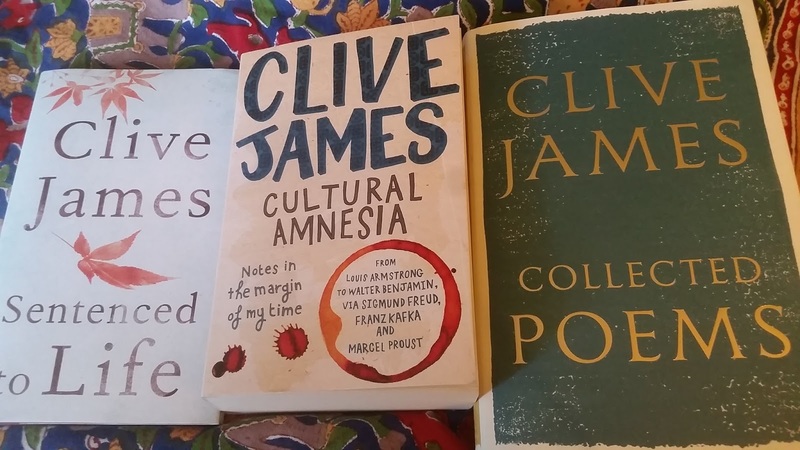 'My mind is coming into focus again, thanks to Clive,' I told the playwright. It has been foggy for months, if you recall. I even had an MRI on my brain! All fine, all fine. Brain in working order. I feel as though I am at university again, only my lecturer awaits me on a faux leather chair while nurses attend to his (and my) blood pressure, heart rate and other vital signs. We are alive, and this being alive is everything. Now. I have no clue who any of these wonderful people are, but your story made everything come to life as though I should know them, and like them. Thank you. Yes. We are a live so let us smile, let us take nothing, and I mean nothing, seriously. Thank you Shaista. It is always such a pleasure to read you. How I adore this description out radiant you, Hobnobbing with such grace. Also to see you posting. I have been trying fruitless lyrics to connect with you. I upgraded my system and lost your email address. Please E me, dear Shaista, so we can catch up. I had brain fog all winter, too, and am worried it might be permanent, lol.......Glad your MRI results were good. Whew. Awaiting an update on your memoir.......wildwoman2@shaw.ca, dear friend.